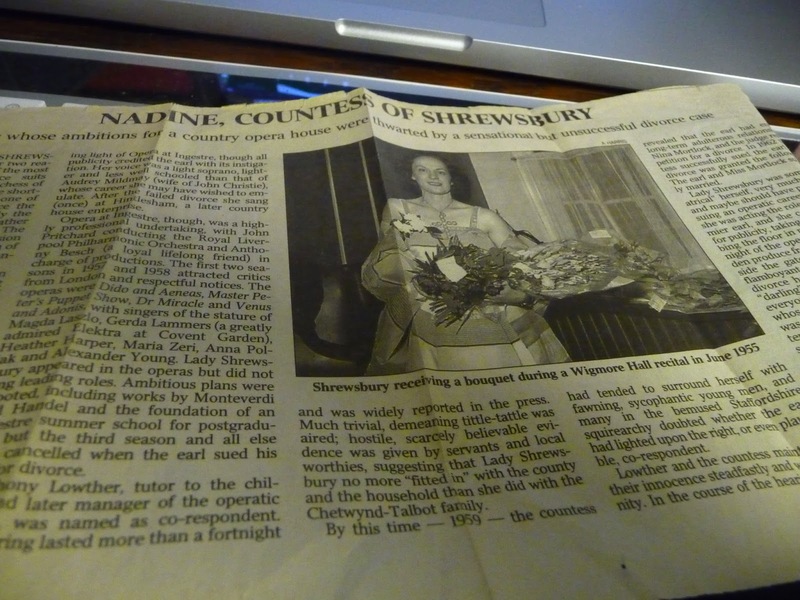 I have no idea why I still have a copy of the Times of London obituary from 2003 of Nadine, Countess of Shrewsbury. One of the treats of traveling to the UK on our antique jaunts was the variety of newspapers that are still available in Britain. I certainly have lost count--but there must be at least 6-7 daily papers still published in London and the Grande Dame is the Times of London. The Times is know for its incredible, entertaining obituaries. These are not your typical brief outline of a person's life. The Times obit writers create an often entertaining mini biography of the deceased, and usually pull no punches. If you were a lifelong drunk, they might describe you as "frequently in her cups" --that type of thing. In 2003, this obituary caught my eye and made me chuckle that I had to clip it and keep it. But now--in my cleaning mode--I will immortalize it here--and toss the clipping. It does not list an writer. "Nadine Countess of Shrewsbury, Singer whose ambitions for a country opera house were thwarted by a sensational but unsuccessful divorce case". The lead paragraph, " She will be remembered for two reasons, as the defendant in one of the most sensational aristocratic divorce suits and as the guiding spirit in the short lived Opera at Ingestre, one of the earliest attempts to reproduce the Gyndebourne experience, into the now rather commonplace country house opera. The two were not unconnected. The invasion by theatrical folk and their hangers-on of a staid, slightly dowdy country environment could not but make waves." Paraphrasing now--She married into a wealthy aristocratic family and moved to the "much restored" Jacobean manor house near Stafford. She had six children. "There was much opposition to the marriage in the Earl's family, as previous Earls had married in the aristocracy." Nadine worked very hard to set up her opera company, and the paper reports that the two seasons of 1957-58 it got pretty good reviews. Now the obit gets juicy. "Anthony Lowther, tutor to the children and later manager to the operatic venture, was named as co-respondent in the divorce case.. The hearing lasted more than a fortnight and was widely reported in the press. Much trivial, demeaning tittle tattle was aired; hostile, scarcely believable evidence given by servants and local worthies....By this time, the countess had tended to surround herself with fawning, sycophantic young men and many in the bemused Staffordshire squirearchy doubted whether the earl had lighted upon the right or even plausible co-respondent." "Lady Shrewsbury was somewhat theatrical herself and very much a performer. Many felt she was acting the role of wife of the earl and she certainly had an eye for publicity, taking care to be seen scrubbing the floor in preparation for the first night of the opera season or selling garden produce from the estate in a van outside the gate." "Her manner was often flamboyant--and much was made of the fact that she called Lowther 'Darling' but she called more or less everyone darling, including the butler, whose surname it happened to be........ She was a most attractive woman, an attentive mother, a lively and spikey conversationalist, referring to her husband's mistress never by name, simply as "The Kiss of Death) and a most entertaining hostess. Whew. Don't you get a really vivid picture of the nature of this woman? Only in The Times. 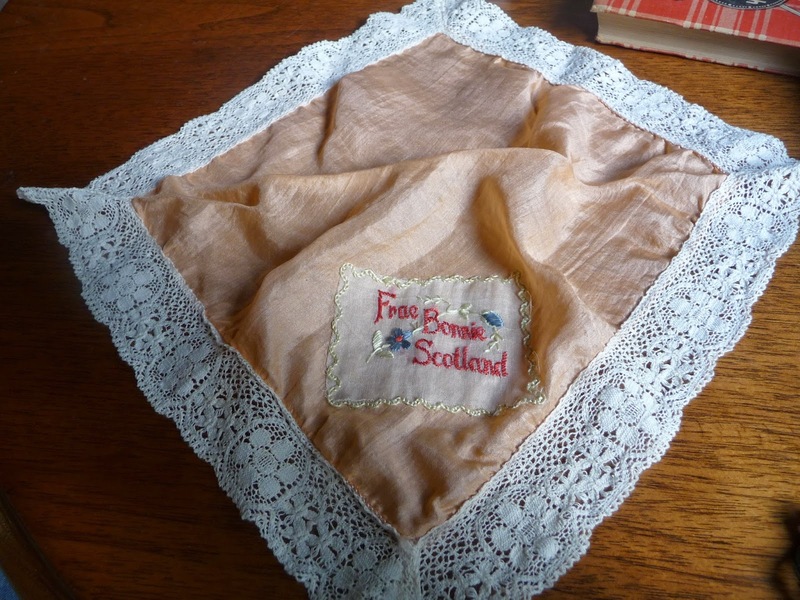 Several years ago, Dear Husbola gave me a sweet little antique silk handkerchief that is embroidered Frae Bonnie Scotland. 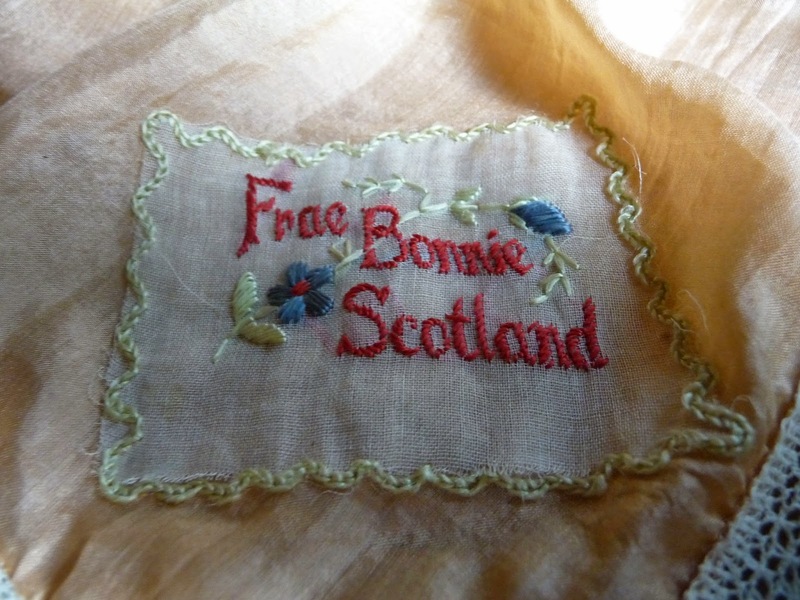 Even as far back as early 20th century, some Scots have been interested in breaking away from Great Britain. I promise this is a politics free zone. The majority has spoken and Scotland will not be breaking away--at least for the next 15 years. 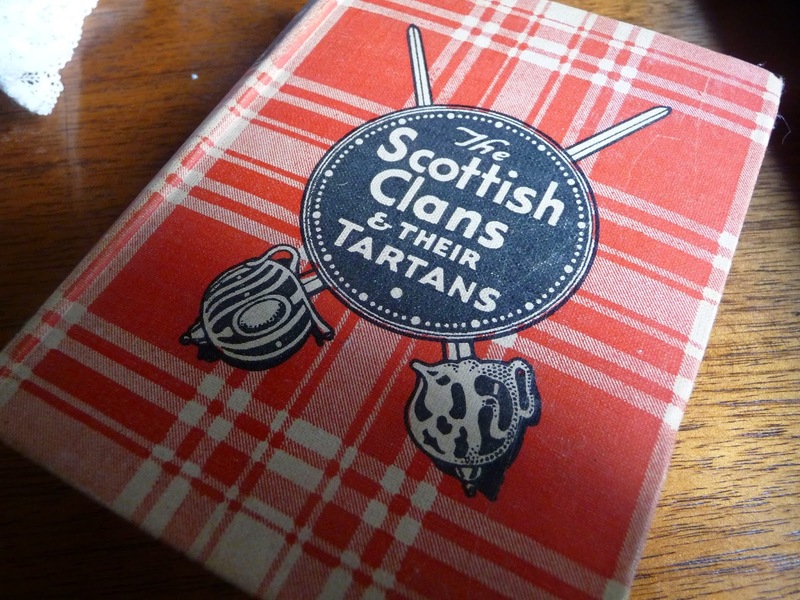 Over the years--we have had some marvelous adventures in Scotland--and many surrounded the eternal hunt for antiques. 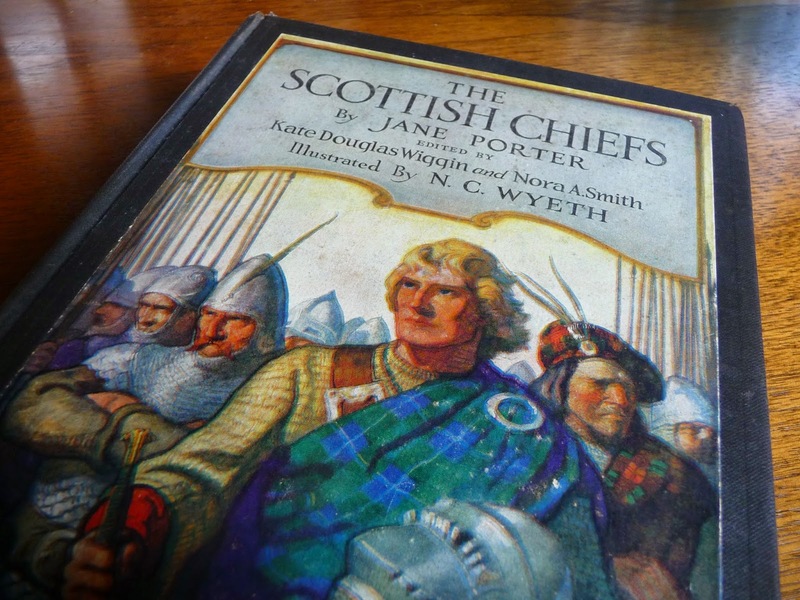 I can trace an immigrant ancestor to the 1650 Battle of Dunbar--Never You Mind that he was on the losing side and became a prisoner and was shipped to Barbados. He redeemed himself by becoming a major landowner in Maryland and started the first Presbyterian church there. Travels to Scotland have included a freighter to the Orkney Islands and A Boat No Bigger Than Your Bathtub to the Isle of Iona. One thing is certain--it is a beautiful country with interesting and warm people. Stories of fearless men and women. 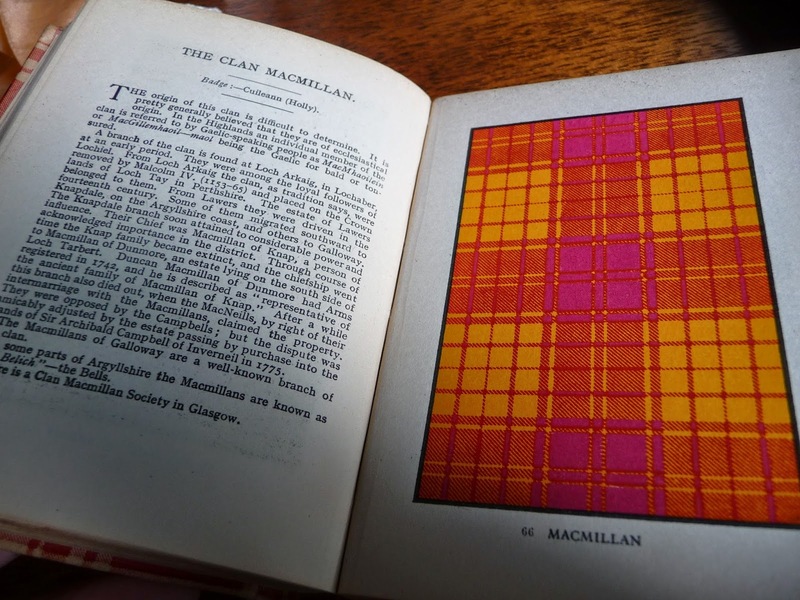 Please don't call this plaid. Something tells me that this will not be the last we will hear of the independence movement. "No one owns it, we are just borrowing it as we pass through..."
I just heard this quote on the daily talk show I listen to on BBC Radio from London. So true so true. This summer is a "digging through stuff" kind of summer for Dear Husbola and me. Cleaning out closets and THE GARAGE and sorting through piles of Such Important Things that we have been holding onto for who knows what variety of reasons. The nature of the antiques business is one of accumulation--for the next show, for the next booth re-set, for the next Just Fix This Little Widget type of thing. I segregate little nooks in the garage and laundry room. This will be perfect for a spring show. This is the type of thing that sells at Odana. This would be perfect to take to auction. This is just--oh I don't know--but I need to hold onto it. But we really are just caretakers for awhile aren't we? All the physical"stuff of our lives gives us comfort, right? Looking through that old high school box or college box gives us warm fuzzy feelings, right?? Maybe not so much. Feng Shui aside--"stuff" is starting to make me uneasy. All the antiques we have in our house or shop are things that other people decided to get rid of. 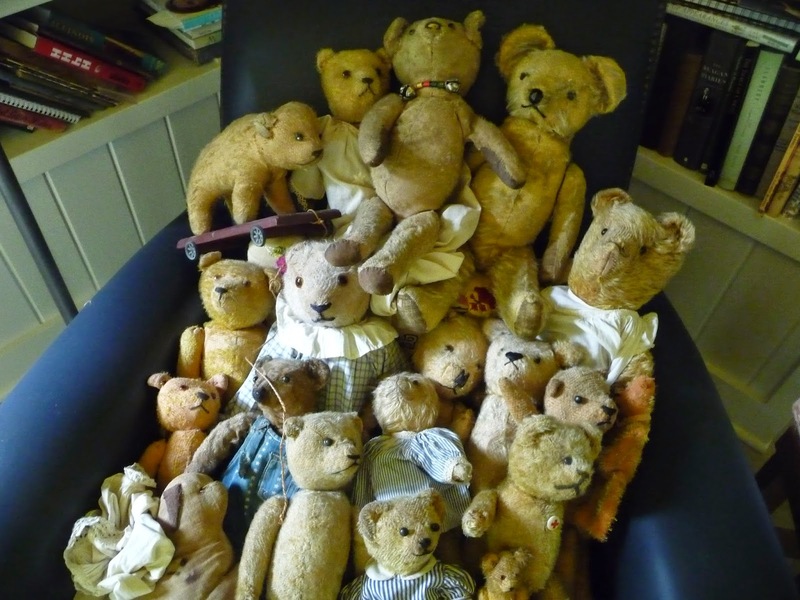 My previous post of all those teddy bears-- they were some other child's plaything. But now they are going to be in someone else's house. Dear little teddies that were near and dear to someone are getting ready to move on. 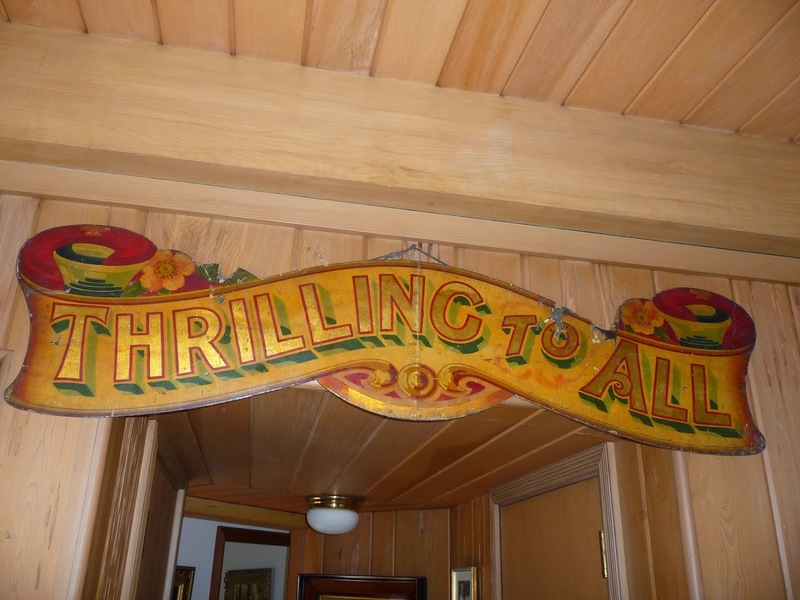 Thank heavens--the ever flowing stream of life and history and things that are the fabric of life. This is not meant to be a downer post. This is meant to be a permission slip to enjoy the "stuff" you enjoy and hold dear--but then give yourself permission to move it on--to the next person to enjoy. 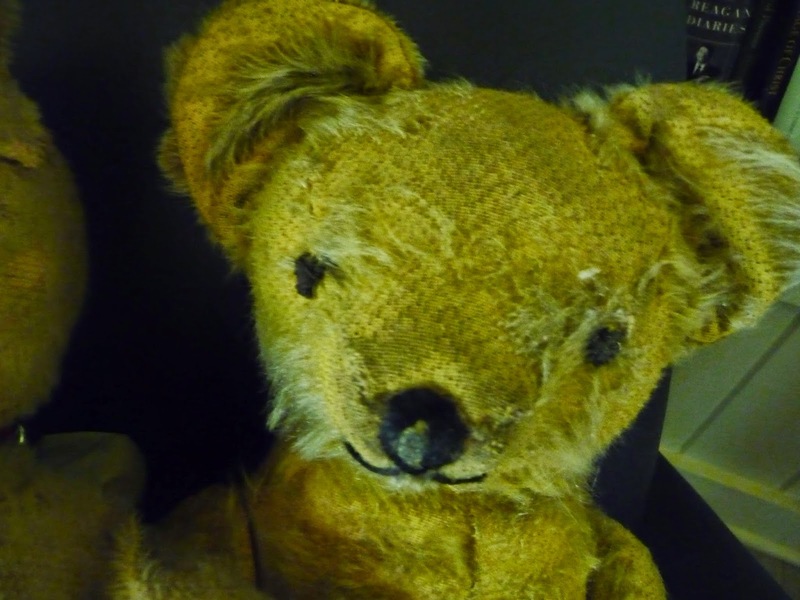 Dear Husbola and I cannot resist old bears. At a recent auction--20 little boys and girls came up in one lot. That is like whole kindergarten class. 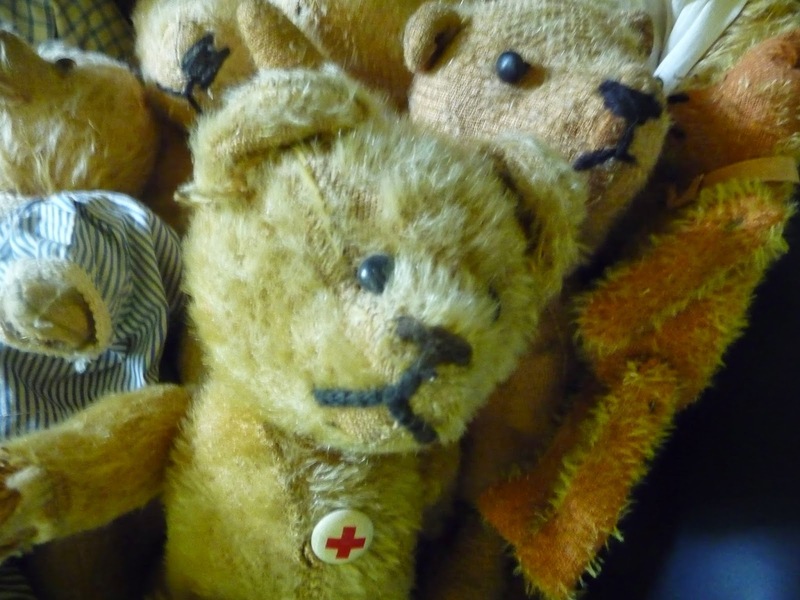 We have been collecting bears for 25 years. I think we got our first one in a shop in York England. He was wearing a jaunty little pair of trousers. Our collection grew and grew--and if you are an overnight guest in our house--you may find a Sweet Little Thing smiling at you from a corner of the guest bedroom. 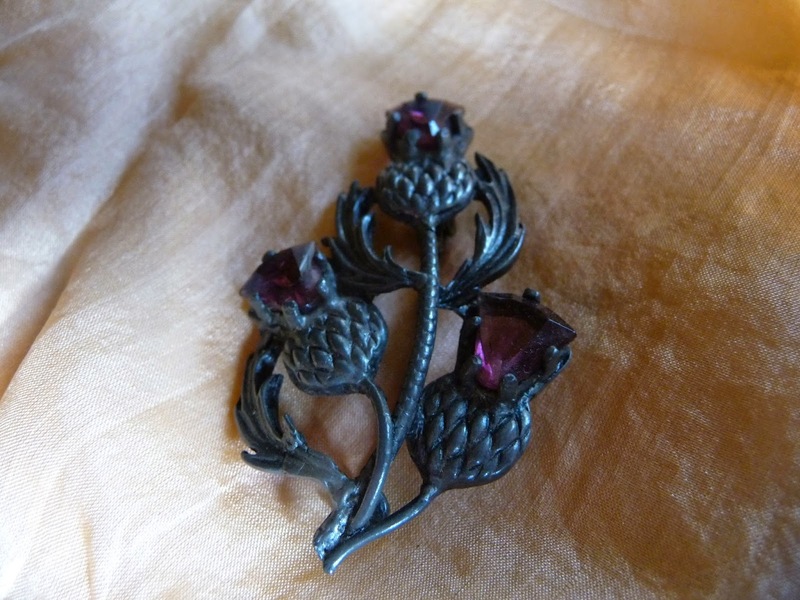 But this little group of twenty-all from the early 20th century--will find their way into new homes. Look at this Little Chap--complete with his vintage Red Cross pin. They are all well loved--but in good condition considering their ages. We will name them and get them ready for their new families.